Each week, I'll be preparing you for the Patriots upcoming opponent with a scouting report, going over the opponent's roster with a focus on how they will specifically match up with the Patriots. 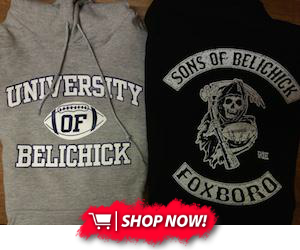 This week, your Patriots will look to keep momentum going with a home tilt against the suddenly surging Los Angeles Chargers. Few would have thought that a month ago, as the Chargers started their season 0-4, with three of those losses decided by a field goal or less. Since then, the Chargers have won three straight to jump back into the AFC playoff picture, riding an impressive defense led by one of the league's top pass rushing duos. Here's a closer look at the matchups that should play out on the field this Sunday. They may still have long time quarterback Philip Rivers (#17), but this years Chargers are a far cry from the units that piled up points and yards year after year under Rivers' leadership. I was surprised to see they actually rank closer to the bottom of the league than the top in both points (19.6 per game, 20th) and yards (330.4 per game, 17th). Simply put, that's below expectations for a Rivers-led Chargers team. The majority of the blame for their offensive underachievement falls at the feet of the Chargers putrid offensive line. Long a problem area for an otherwise well stocked offensive roster, the Chargers line has been one of the league's worst this season. They've failed to generate movement in the running game and their inability to protect Rivers has limited his opportunities to connect with a dangerous group of passing game weapons. The offensive line's inability to open holes in the running game has been particularly costly. The Chargers went into this season with visions of an extremely balanced offense that would feature running back Melvin Gordon (#28), using the run game to set up play action deep shots. That simply hasn't come to fruition because they've been unable to get Gordon going on the ground. Despite looking explosive and tough to bring down, Gordon has managed just 3.4 yards per carry. He's actually done well to gain the 394 rushing yards he's gotten, as many of those yards have come despite getting hit in the backfield. As a team, the Chargers rank bottom five in yards per carry (3.5, 28th) and rushing yards (554, 31st). It's tough to judge Gordon based merely on his stats, as he's displayed the physical talent that made him a first round pick in 2015. At 6'1" and 215 pounds, Gordon is big enough to run through contact and break would-be tacklers, but he's hardly a one dimensional power back. Instead, the strength of his game is his explosive athleticism, which makes him very dangerous when given an opening. In spite of his struggles on the ground, I'd still expect him to be a focal point of the Pats defensive game plan, with an emphasis on swarming to the ball and gang tackling to prevent him from escaping and creating a big play just on sheer physical talent. A mere look at the stat sheet shows that Gordon has been a true "bell cow" back for this team, as he's logged 117 of their 158 rushing attempts this year. Minimal change of pace duties had been handled by veteran Branden Oliver (#32), but a hamstring injury has kept him out of the last three games and leaves his status for this week iffy at best. His absence has opened up an opportunity for UDFA rookie Austin Ekeler (#30), who has given the offense an occasional spark as a third down type back. 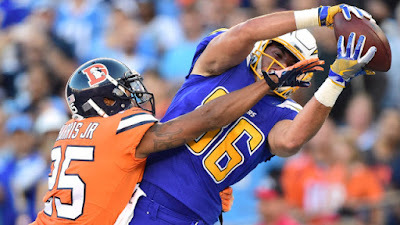 Ekeler probably cemented his role as the top backup to Gordon with an impressive performance on Sunday against the Broncos, generating 38 yards on only 7 carries while chipping in another 4 receptions, including a touchdown on a swing pass. Both Ekeler and Gordon bring passing game versatility to the table. Gordon actually ranks second on the team in passing game targets with 43, hauling 29 of them for 228 yards and four touchdowns. Gordon has actually scored more touchdowns in the passing game than on the ground, serving as a valuable checkdown option for Rivers. 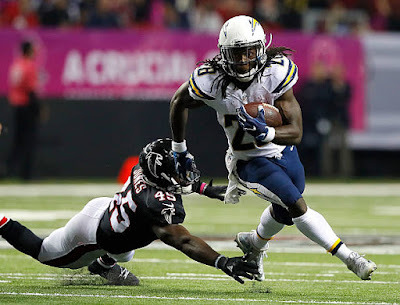 Those receptions have also created additional opportunities to utilize Gordon's open field running ability, which has proven to be important for an offense that features Gordon as one of their top playmakers. Ekeler has been good in the passing game too, catching 13 of his 17 targets in the past four weeks. Those checkdowns have been important for Rivers, who has often found himself running for his life this season. The lone bright spot on the offensive line has been the play of left tackle Russell Okung (#76), who has rebounded from a poor 2016 season with Denver to look more like the guy many thought was a franchise left tackle earlier in his career. Okung has been poor as a run blocker, but he currently has PFF's 16th highest pass protection grade amongst offensive tackles. Unfortunately for the Chargers, Okung is the only blocker on this team to even approach adequate PFF marks in protection. The right side has been manned by veteran Joe Barksdale (#72), who has struggled while playing through a lingering foot injury. That injury finally took him out of the lineup last week, as he was inactive in favor of former Bronco Michael Schofield (#78). A former third round pick, Schofield was a turnstyle for all three of his seasons with Denver, and his former team predictably victimized him last week. Barksdale's availability for Sunday is unknown, but a hobbled Barksdale has still been better this season than Schofield, who has been brutal every time he's gotten on the field. Things aren't much better on the interior, where Sunday's biceps injury will force starting left guard Matt Slausen to season ending injured reserve. With second round pick Forrest Lamp also on IR with a torn ACL, the team will turn to third round rookie Dan Feeney (#66) to fill the void. The rookie has actually looked alright in his limited opportunities, including fill-in duty once Slausen went down last week against Denver, but it remains to be seen how he'll perform in his first career start. The book on Feeney as a highly touted draft prospect was that he was a little undersized but highly athletic and an excellent fit for a zone blocking scheme. We'll see how he holds up against big bodies like Alan Branch and Lawrence Guy inside, guys who might have to take on a bigger workload if Malcom Brown is unable to go on his injured ankle. Right guard will be manned by Kenny Wiggins (#79), a veteran who has hung around the past few seasons with the Chargers as a utility backup. Wiggins would likely be a swing backup again this year, but the preseason injury to Lamp forced him into the lineup, where he's predictably been overmatched. Meanwhile, second year UDFA Spencer Pulley (#73) has unexpectedly become the Chargers starting center. Many thought that job would belong to Max Tuerk by now, a highly touted third rounder from last year's draft who would've gone even higher if not for injury. He essentially redshirted last year but disappointed in camp before landing a four game suspension for PEDs. The Chargers, despite their obvious needs up front, released him once that suspension was up, leaving the job to Pulley. Pulley was a feel good story last year as an undrafted rookie who unexpectedly earned a job and eventually contributed at both center and both guard spots. He's another guy who would be better suited as a interior swing backup, as he's been one of the league's worst starting centers. Can the Patriots much maligned pass rush make the Chargers pay for putting such a subpar offensive line out there? That will be a key to this side of the matchup, as the Chargers have some playmakers in the passing game if they can give Rivers enough time to let routes develop. 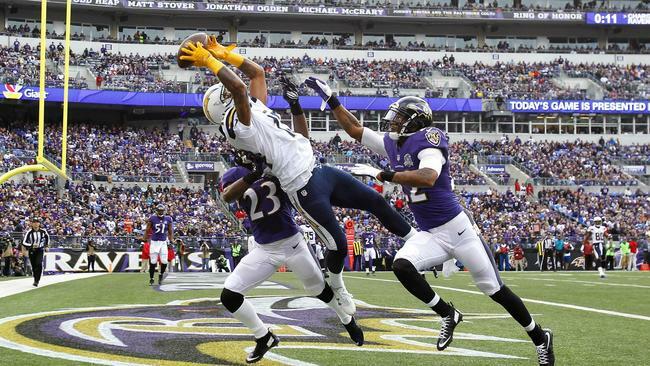 The top weapon, of course, is receiver Keenan Allen (#13), who has been a star since joining the team as a third round pick in 2013. Allen's status as the top dog in this passing game is unquestioned, as his 68 targets are 25 more than his closest competitor (Gordon). In fact, last week's win was the first time this season Allen failed to see at least 9 targets in a game, as Rivers only looked his way 7 times. Allen's status last week was cast into doubt when he suffered a shoulder injury in Thursday's practice before missing Friday's session. He did in fact play and while his stats were down (3 catches, 41 yards), that appeared to be more due to Denver's tight coverage than any physical limitations. Allen isn't the biggest or fastest receiver, but he's a fantastic route runner who simply knows how to set up defensive backs and get open. He's also got excellent hands and enough size (6'2", 211) to use his body to shield defenders from the ball on intermediate routes. Allen's efficiency has taken a hit this year due to his extremely high volume, but his counting numbers are still excellent: 36 catches for 487 yards and a touchdown. Allen is joined in two receiver sets by Tyrell Williams (#16), a lanky long-striding speedster who is a major big play threat. Signed as a UDFA in 2015, Williams broke through last season after injuries to Allen and Stevie Johnson opened an unexpected opportunity for playing time. That season ended with 69 catches for 1,059 yards and 7 touchdowns, numbers made all the more impressive by him not earning a consistent role until midseason. Williams looked on pace for a similar outlook through the season's first four weeks, but his role has taken a backseat recently as the Chargers have focused more on the running game and short passes. After seeing an average of six targets a game through Weeks 1-4, he's managed only six targets total during the last three contests. His combination of speed and size (6'4", 205) still makes him dangerous, particularly on crossing routes where he did a lot of his damage during last year's breakout. There's been many factors in Williams' declining role, but one has been the re-emergence of Hunter Henry (#86) at tight end. The 35th overall pick in the 2016 draft, Henry looked like a star in the making as a rookie, catching 36 balls for 478 yards and 8 touchdowns despite playing largely as the second tight end behind the legendary Antonio Gates (#85). That rookie season led many to peg Henry as breakthrough candidate this year, but his sophomore season got off to a rough start, with just 10 targets and two target-less games in the season's first month. The Chargers three game winning streak has coincided with a renewed emphasis to include their young star tight end in the passing game, as he's seen 8, 7 and 5 targets during that streak. They've been rewarded for that emphasis, with the young tight end averaging 4 catches for 68 yards over that stretch. Henry could be a major problem for the Pats, who did do well against fellow 2016 draftmate Austin Hooper this past Sunday. At 6'5" and 250 pounds, he's got the size of a true in-line tight end, which has helped him to become a surprisingly competitive blocker early in his career. However, his true strength is as a pass catcher. Henry is already an advanced route runner who, like his teammate Allen, has knack for setting up defensive backs attempting to cover him. He also has excellent hands and concentration, which helps him both in contested catch situations. He's willing to take a hit to secure a catch over the middle and is an excellent red zone target, where his size really becomes a factor. He also is a good run after the catch player, showing enough strength to break through would-be tackles from defensive backs along with solid instincts in the open field that allow him to get the most out of his opportunities. Henry's emergence has also allowed the team to pick their spots more carefully with Gates, who is now in the 14th season of a career that will likely end with a bust in Canton. In his prime, Gates was an uncoverable mismatch who helped to redefine the tight end position as an offensive weapon. He's not the dynamic force he once was, but Gates can still be effective in the right spots. 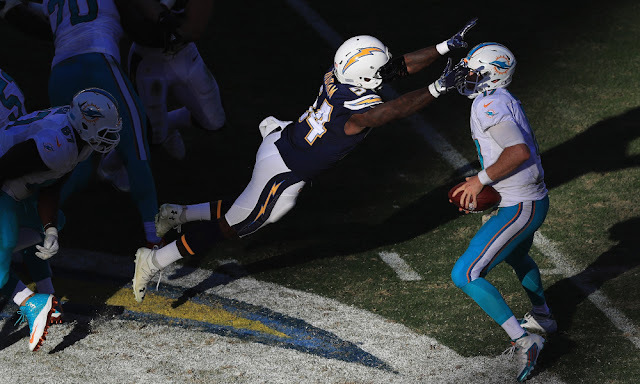 The Chargers have let the younger Henry take more of the blocking snaps, as blocking was never Gates' forte anyway, but still bring out Rivers' long-time safety valve in critical situations, such as third downs and red zone opportunities. Gates doesn't have the same type of explosiveness that once made him so difficult to defend, but he's still a very crafty route runner who uses his body well to shield defenders from the ball in the intermediate portions of the field. The trust factor he has with Rivers can't be overlooked as well; it wouldn't shock me to see Rivers looking for his long-time partner in a critical situation. The picture gets murkier the further you go down the depth chart at receiver here, as this spring's number overall seven draft pick is just beginning to get his feet wet in the NFL. That would be Clemson product Mike Williams (#81), a 6'4", 220 pound monster who comes to the NFL with a reputation for using his size and length to consistently come down with contested catches (a la Kelvin Benjamin). The Patriots will have to largely go on that college reputation, as Williams has done little in the league yet due to a back injury suffered during rookie minicamps. 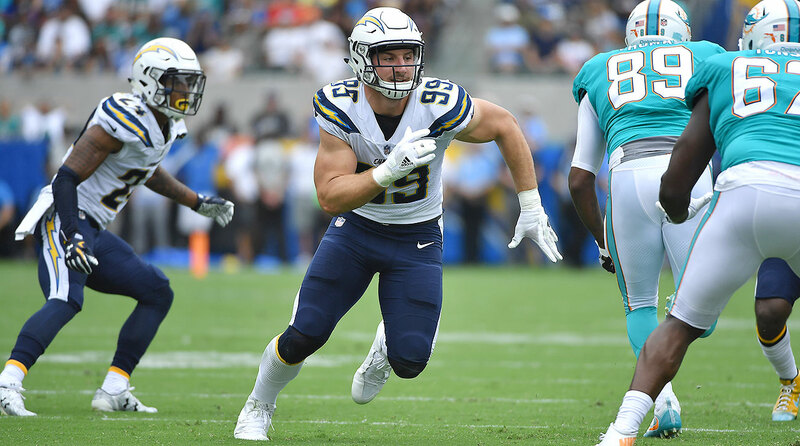 That injury sidelined the Chargers top pick throughout training camp and through the season's first five weeks, with the rookie playing sparingly in the past two games. It remains to be seen if his workload will increase this Sunday, although Wednesday's trade of fellow receiver Dontrelle Inman can only be a good sign for his expected workload this season. For now, Williams appears to be in a timeshare with veteran Travis Benjamin (#12) for third receiver duties, with Benjamin still playing slightly more than the rookie. Those two players couldn't be further apart skillset-wise: while Williams is a slower receiver that wins with his elite size and catch radius, the diminutive Benjamin (5'10", 175) is a dynamite athlete who wins simply by outrunning people. He has yet to develop into the complete receiver the Chargers paid him handsomely to develop into during the 2016 offseason, but he still has the unique ability to outrun nearly anyone at the NFL at any given second. Not only is he a dangerous deep threat, but the Chargers also utilize that speed on crossing patterns as well. Make a mistake in coverage against this guy, and he has the jets to turn it into six within seconds. How the Patriots cover this group of skill guys will depend quite a bit on health, as corner Stephon Gilmore remains a question mark. Gilmore's return to practice Wednesday is a good sign of his progress through the concussion protocol, and he could very well be cleared by Sunday barring an unforeseen setback as he ramps up his practice participation. It remains to be seen if he will waltz right back into his starting job upon his return, as Johnson Bademosi has impressed in his absence. The Chargers heavy-usage of man-beating tactics such as crossing routes also poses a challenge for a Pats defense that is at it's best in man coverage. I'd tentatively expect the Pats to largely stick with their preferred man coverage, with switch concepts built in to deal with bunch formations, crossing routes and other Chargers staples. Defensive communication will bear watching if Gilmore does in fact return this week, as that aspect of defense improved noticeably during his time away from the field. It's been a major defensive turnaround this year for the Chargers. After years of mediocre defense contributing to sub .500 records, this year's squad is allowing a stingy 18.7 points per game. Only seven teams have given up fewer points than these Chargers, who also rank in the top 10 in passing yards per game (185.4, 5th), net yards per pass attempt (5.5, 8th) and sacks (23, 4th). Sacks really are the key stat to look at there, as the Chargers defensive success can be directly linked to the dynamic edge rushing duo of Joey Bosa (#99) and Melvin Ingram (#54). Those two have simply dominated, combining for 16 sacks and three forced fumbles. The constant heat that they put on quarterbacks has helped the entire defense, as opposing quarterbacks have been forced to rush their reads, often taking harmless checkdowns out of necessity. That rush is especially important for this defense, which runs a lot of the same cover 3 zone concepts that the Patriots saw last week from the Falcons (like Atlanta coach Dan Quinn, LA defensive coordinator Gus Bradley rose to football prominence in Seattle with the Legion of Boom). Bosa typically lines up as a traditional defensive end, a spot from which he's produced at a Hall of Fame pace ever since taking the field as a rookie last year. He's built on last year's Rookie of the Year season with a fantastic start to 2017, racking up 7.5 sacks and 2 forced fumbles. Simply put, he's as complete of a defensive end as there is in the league. He's an excellent athlete with more than enough speed to beat opposing tackles around the edge, but speed is just a small part of his game. He also has more than enough strength to counter with power back inside when tackles overplay the outside. He uses his long arms well to keep opposing tackles from getting their hands on him, while also using his own hands exceptionally well to win with technique and leverage. That length comes in handy, whether it be disengaging from blockers in the running game or getting his hands up to disrupt passing lanes. He also plays with an excellent motor. Once he gets free from his blocker, he is going to find and chase down the ball carrier, regardless of how far upfield said ball carrier is. That hustle is also a problem in the running game; running away from him is ineffective because of how quickly he'll run plays down if unblocked on the backside. Bosa also is equally comfortable at either side of the defense, meaning that both Nate Solder and Marcus Cannon will have to prepare for him. They'll also have to prepare for Ingram, who might be having the slightly better season of the two. Another first round pick, Ingram is freakishly explosive rushing off the edge, with a closing burst that's allowed him to rack up 8.5 sacks and a forced fumble himself. While Bosa typically sticks with his defensive end alignment, Ingram has blossomed into a versatile chess piece who can rush from just about anywhere. A glaring example came from last weeks win over Denver, as Ingram came flying through the middle of the line untouched on an inside loop to land a crushing hit on Trevor Siemian. The entire Patriots offensive line will have to be aware of Ingram's whereabouts at all times, as will Tom Brady and the other backs and tight ends involved in his protection calls. His pure explosive rushing ability can create game changing plays if he's allowed a free lane at the quarterback. Ingram's versatility allows the Chargers to bring more rush talent onto the field on third down and other obvious passing plays. Chief among them has been Chris McCain (#40), a situational pass rusher who has exploded for 5 sacks already in 2016. Previously a journeyman UDFA who had bounced around the league since 2014, McCain has fully taken advantage of getting consistent playing time for the first time in his career. He's a long, lanky athlete with natural ability to bend around the edge and beat tackles with speed. McCain only got his opportunity because of a preseason hamstring injury to 2014 second round pick Jeremiah Attaochu (#97). Another long, lanky edge rusher with explosive burst, Attaochu has flashed talent the rare times he's been healthy enough to be on the field. However, the tantalizing talent has been star crossed with injuries so far in his career. Chargers fans had him pegged as a breakthrough candidate last year following his 6 sack 2015 campaign, but 2016 was essentially a lost year after a high ankle sprain and broken foot help him to only 8 games, playing many of them still hobbled by the bad ankle. Last week was his first appearance of 2017, as he missed the first six games with that lingering hamstring. The Chargers predictably eased him in, playing him just 21 snaps as a rushing specialist. With four talented edge rushers now at his disposal, the scheme possibilities are endless for defensive coordinator Gus Bradley. The Denver game saw them break out a Giants inspired "NASCAR" formation, with Bosa, Ingram, McCain and Attaochu all on the field as stand up defensive linemen. They also have used their depth to play more games with Bosa and Ingram, often lining their two best rushers up on the same side to create confusion amongst the offensive line. One great example of this came from their win over the Giants, with Bosa setting up Ingram to easily win inside against left guard Justin Pugh. Simply put, this game will likely be the biggest challenge all season for the Pats big guys up front. It wouldn't be fair to expect them to shut these guys down, as Bosa and Ingram are too good to not make a play here or there. However, if the Pats line can hold them off for a few seconds, that should be enough time for Brady to get rid off it safely. One effective counter to a strong pass rush has always been a strong running game. That's an area I'd expect the Patriots to keep hammering after doing so effectively last week against the Falcons. As good as LA has been at rushing the passer, they've been almost as bad at stopping the run. Last week was a breakthrough for them in this area, as they focused on the run game and held the Broncos to merely 69 yards on the ground. In the six games before that, they allowed an average of 152.5 rushing yards per game. Only the Jaguars have surrendered more than their 4.9 yards per carry allowed. The reasons for this are obvious upon glancing at their roster. As good as they are on the edges, they lack top end talent in the middle of the defense. That applies both to the interior of the defensive line and the linebacking level, where they've really missed the injured Denzel Perryman. It's been a steady rotation at defensive tackle, with veterans Corey Luiget (#94) and Brandon Mebane (#92) the leaders in playing time. Luiget has been the best player in this bunch, particularly as a source of interior push as a rusher, and has been a productive member of this defensive line ever since he was drafted in the first round back in 2011. However, he missed last week's game with a back injury and his status for Sunday is murky at best. He did practice on a limited basis Wednesday, which is an upgrade over the DNPs that riddled the injury report leading up to the Denver game. While Luiget's play this year has generally lived up to his reputation, Mebane's has not. Best known for spending years as a gap plugging load up front for Bradley's Seahawk defenses, the now 32 year old missed most of last year with a torn bicep and hasn't looked like the same guy in his return to action this year. He's earned shockingly poor grades from PFF, especially against the run, which was a major strength of his game in his Seahawks prime. At 6'1" and 311 pounds, Mebane does offer the Chargers a big body up front, but he hasn't put it to particularly good use this season. Mebane and Luiget have far more name recognition than the rest of this rotation. Darius Philon (#93), Damion Square (#71) and Tenny Pelepoi (#95) have all logged rotational snaps on the interior as well, with none of them having any particularly noteworthy contributions. The Chargers lack of bulk in this rotation is eye-opening, as Mebane is the only player to exceed 300 pounds in their rotation. Luiget and Philon are both listed at 300 even, while Square and Pelepoi are in the 290 pound range. With so little bulk up front, it's not surprising teams have been able to run up the middle against these guys. Another factor has been subpar play at the linebacking level, where they were counting on the injured Perryman to run the defense. Linebacker has been a bit of a carousel this season, as Jatavis Brown (#57) began the season as an every down starter but has since been demoted due to poor play. An explosive rangy athlete, Brown impressed as a rookie last season and looked poised for a bigger playmaking role in his sophomore season. However, poor discipline and an inability to shed blocks in the running game led to his disappointing demotion, as he is now a part time player in sub packages. His speed is something to note when he is in the game, as he gives Bradley yet another explosive athlete to play around with as he schemes up pressure packages. Middle linebacker has been manned by Hayes Pullard (#50), a limited athlete whose calling card is his ability to read defenses and run the huddle. A seventh round pick of the Browns in 2015 following a standout career at USC, Pullard had bounced around the league earlier in his career, landing with the Chargers this September after he was released as part of Jacksonville's final cuts. His experience with Jacksonville proved invaluable for the Chargers, as he was able to seamlessly transition into LA's defense due to his familiarity with former Jacksonville coach Gus Bradley's scheme. Pullard is known as a football junkie and a coaches and teammates dream, but he's also a limited talent. He's not fast enough to hold up long in coverage against pretty much anyone, and isn't strong enough to shed blockers once their able to get their hands on him. The fact that he remains the Chargers best option at middle linebacker is a pretty damning statement on their depth. A recent development in this defense has been the rise of strong safety Adrian Philips (#31), who has been used in the box quite a bit as a "linebacker". That hybrid role has been on the rise in the NFL over the past few years, as it gives defenses an extra coverage option without sacrificing too much on run defense. Philips isn't going to shed any offensive lineman once he gets his mitts on him, but he also can use his speed to zip into gaps and disrupt plays in the running game. Look for him to continue to play as the de facto starting linebacker next to Pullard on most downs, as his coverage ability will come in handy this week against the pass catching talent your Patriots have in their backfield. The rest of the linebacker rotation is made of part timers Kyle Emmanuel (#51) and Korey Toomer (#56). Toomer has been solid, relying on his experience as a former Seahawks draft pick in the system to reliably fulfill his scheme assignments. Meanwhile, Emmanuel has seen his playing time take a step back after spending much of last year as a starter. He's respectable enough in coverage, but is yet another Charger who has struggled to stop the run. In case it wasn't obvious enough, I think the Patriots should go into this one looking to test this weak underbelly of an otherwise strong Chargers defense. Establish the run. Don't let the Chargers pass rush take over the game. Don't let them take your home crowd out of the game. Keep the offense in manageable down-and-distance situations. Prevent the offense from predictable third and long passing situations, when that pass rush can really wreak havoc. Feed your rotation of Dion Lewis, Rex Burkhead and Mike Gillislee, all of whom have more than enough talent to punish the Chargers up the middle. When the Patriots do throw, they'll be looking at the same cover 3 principles they faced last week from the Falcons. That scheme in its most basic form, splits the deep part of the field into three zones. The middle is occupied by free safety Tre Boston (#33), who plays the Earl Thomas role as the single high centerfielder of this defense. The right and left deep zones are typically the responsibility of the outside corners, who in this case are Casey Hayward (#26) and Trevor Williams (#24). Meanwhile, the short/intermediate portion of the field is typically split into four zones, occupied by linebackers and strong safety Jahleel Addae (#37). The scheme is designed to take away the deep ball and force the quarterback to stick with shorter passes, into the intermediate zones that are packed with coverage defenders. They've of course been aided by their pass rush, but these Chargers defensive backs have done an exceptional job of playing their scheme to perfection. That can be shown statistically, as quarterbacks have completed a solid number of passes on them (65.6%) but only for 6.7 yards per completion. All of those aforementioned starters have played well this year, but the cornerback duo of Hayward and Williams has particularly stood out. The play of the veteran Hayward has not been surprising, as Hayward has been one of the league's better corners ever since entering the league as a second round pick in 2012. However, Williams has surprisingly stepped up to negate the loss of Jason Verrett, an oft injured former first round pick who was once again lost for the season to a knee injury after just one game. Williams, a little known UDFA from the previous season, has excelled in his new role as a starter, earning PFF's 11th highest grade amongst corners this season (Hayward ranks 9th). He's played excellent assignment football, showing good ball skills as a corner (1 pick, 5 passes defensed) while also showing up as a reliable tackler against the run. Nickel corner duties are handled by Desmond King (#20), a fifth round pick from this spring's draft. King fell further in the draft than is outstanding college career warranted (he won the Jim Thorpe award as the best DB in college football in 2015), largely due to a lack of elite athleticism. 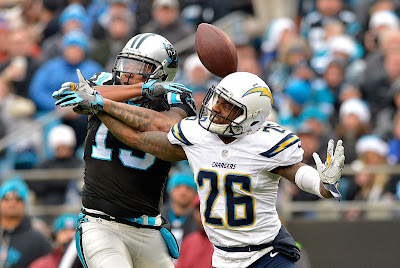 King may never be a top shutdown corner due to those physical limitations, but his outstanding instincts, ball skills and tackling make him a nice fit for the Chargers zone scheme, especially as an inside slot corner. His ability to step into that all important slot role has been key for this defense, as they've managed to not skip a beat despite losing a top talent like Verrett. Safety play has been excellent as well. Free agent signing Boston has been a godsend, putting his range to good use on the back end of the defense. He flashed in previous seasons with the Panthers but never came close to the consistency he's shown this season as the unquestioned starter at free safety. Meanwhile, Addae has rewarded the team for this spring's contract extension with the best play of his five year career. Known as a bone-rattling hitter, Addae has been extremely active in the box, while also holding up in coverage. He'll still be a major target of Brady's if he winds up being the primary option to cover Rob Gronkowski. You can bet the Chargers special teams are on Bill Belichick's radar after their performance on Sunday. Travis Benjamin's 65 yard punt return touchdown was a huge play in that game, as it gave the Chargers a lead they would never relinquish. Benjamin nearly broke a second big play in the punt return game as well, flashing his trademark explosiveness and escapability on a 20 yard scamper. Preventing Benjamin from making similar momentum altering plays will undoubtedly be a big focus of Bill Belichick. Benjamin has long been one of the league's most dangerous return specialists, boasting the explosive speed, vision and cutback ability to break a big play even against strong coverage. The Chargers are less dangerous returning kickoffs, where neither Desmond King nor Austin Ekeler have broken any of their opportunities open for a big play. The rest of the Chargers special teams have been up and down. Missed field goals from rookie kicker YoungHoe Koo cost them dearly during their season-opening four game losing streak. Koo has since been released and replaced by veteranNick Novak (#9). Novak has made his bunnies so far, but missed his lone attempt of 40+ yards. Punter Drew Kaser has a booming leg that has been on display, averaging 50.3 yards per punt with a long of 69. Unfortunately for him, his teammates haven't particularly held up their end of the bargain, allowing 9.3 yards per return. Normally I'd say this is a spot were Danny Amendola could break a big play, but the Pats top punt returner could be held out this week as he deals with a hyper-extended knee. It will be interesting to see who gets the nod to catch punts if Amendola is out (my money would be on Patrick Chung).